It felt like a real 5th of July because the fireworks debris in the backyard. We went to the RB chapel where we met President and Sister Von Stetten for the first time and after sitting in on an introduction talk by the president – more about the later – and Sis VS, we took sister VS on a tour of some of the area. We went to Esikhawini and showed her the chapel complex there, then it was on to PD where we dropped off a number of things and ended up showing her the PD chapel. It also gave us a chance to take a picture with Ayanda and say good bye. After lunch we went to Enseleni and picked up Khulekani. He said goodbye to Nonhlahla and Thandi as well as his wonderful Gogo. She seemed very proud of her grandson and his decision to go on a mission. After being interviewed and set apart, Elder Mchunu got his picture taken with the Von Stettens. He will return in 2 years and help them build the kingdom in RB. We actually got some pictures of the two of us. This has not happened often on our mission. Elders Ssenga, Mchunu and Webster – they have often worked together. We took pictures with all the elders who were at RB that we had worked with including elder Nkosi who is now serving as an assistant. This entry was posted in Mission - South Africa on July 6, 2010 by Bill. The RB Zone and our last chance to fill up some hungry missionaries. They really loved the tacos, refried beans, fruit salad and everything else we served. Some of them actually complained that they had much too much to eat. We love to hear that. Elder Brinkman is not trying to eat the plate in that last picture, just making sure he does not miss a single drop of food. When some of the elders talked about having sparklers for the 4th we asked around and heard about an Indian store that might have some. They were closed but the Richards Bay elders found an Indian family who gave them three boxes of left over ones. They were over 2 feet long and worked well – like the old kind before safe and sane. We all had a great time celebrating the 4th. This entry was posted in Mission - South Africa on July 4, 2010 by Bill. Mary with her some of her piano lesson students. It was the last time here that she will be able to teach Lungani, Sazi, and Musa. However on Sunday Sazi and Musa played for sacrament which was a very special gift for her. On this last Saturday we did see a number of families in Port Durnford. The three small Malondo children thought our names were ‘How are you’ because that is the way we always greeted them when we came to visit and go to church in the chapel in their back yard. We became great friends with Bongumusa and his family. He is very talented and dedicated to getting a good education and job so he can take care of his mother and sister. This was another case of being in the right place at the right time. As we drove around a bend a small herd of Cape buffalo started across the road. After we had taken our pictures – I missed one where the calf was trying to get a drink of milk and walk at the same time – and the herd had moved across we drove another K up the road and then turned around and came back. In the 2-3 minutes we were away, the herd had all but disappeared into the bush and we only saw a glimpse of one or two because we knew they should be there.That is why on a game drive one car can see lots of animals and another one just minutes later or earlier will say there were none to be found. 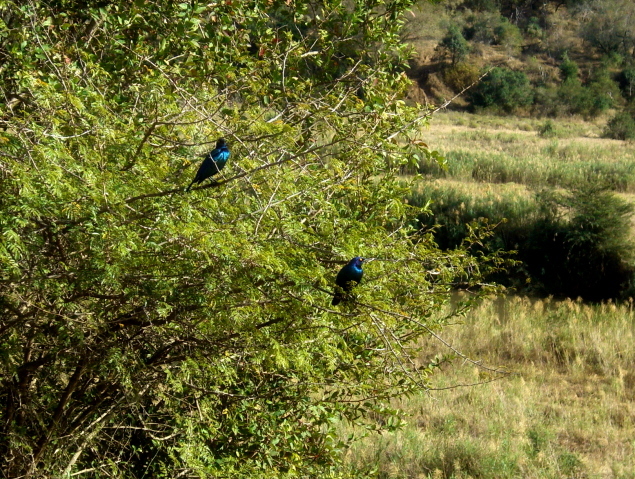 We love Cape Gloucester starlings and we saw many on this trip, but none posed for us a these two did. As we crossed over a small bridge we saw this young dead nyala on a sandbar. It did not appear that it had been killed by a predator and there were no scavengers around. Perhaps it was very ill and had come for a drink and had just laid down and died. Mary took the picture of the dry creek bed with the mountains in the background. I chose one of the myriad of wonderful dead trees that dot the landscape of the park. This entry was posted in Mission - South Africa on July 3, 2010 by Bill. When at the end of the day the herd of large animals you find in the grass turn out to be elephants instead of the rhinos you were looking for and you say “It is just another herd of elephants,” you know you have been on too many game drives. This was the first time we have been to Umfolozi and Hluhluwe and never saw a single rhino. But we found lots of elephants and at one time we were pretty much surrounded by them. The nice sized bull found a great place to eat – unfortunately it was right across the road that we needed to go down. While it was great to get some good close-ups it would have been nice if he had decided to go elsewhere for his main course. Because a big bull was blocking one road of a Y we backed up so we could go the other way and lo and behold a family of them came out of the bush and paraded down the other road. We could do nothing but patiently wait until they all decided to get off the road and eat in the bush. Not their best end…but we saw a lot of this view in our drives. Mother and child…honest the child is there. We did not find any elephants at the usual mud hole because it seemed to be pretty dry, but we did later find them along the Umfolozi river. We were heading down the road on the last part of the drive and were surprised to come across this single elephant crossing in front of us. We thought he would be our last elephant of our mission so we took a number of pictures including what we will call our last elephant picture. We would have rather have found a rhino crossing the road. This was the last picture of an elephant we took while on our mission. We could have taken some very distant shots later – as mentioned about – but did not bother. President and sister Vilane – we will miss these two wonderful Saints. One of the joys of going to Port Durnsford is the quality of the roads that we go on to see some of the families. I managed to get stuck pretty well today but luckily I was very close to the Chirwa’s house and the young men came out and helped me push it out of the hole. My pants looked pretty much like the car! We stopped in to see the Nzama’s before going to youth. Gogo Nzama was not feeling well so they took her to the hospital. As we were leaving Youth, the family stopped by and we were able to talk to her for a moment. Little did we know that within 12 hours she would pass away. A last shot of the Port Durnford chapel. Many wonderful memories of meetings on Sunday. Also we will remember the Youth we met with almost each Thursday. Notice how the sisters are all singing. On the other hand the YM tend to try and hide. A last picture of the regular class along with a lot of Ayanda’s cousins. The view from the PD yard is always changing. As I went in to get some maps made I saw this line for pre-paid electricity…it was longer when I came out and I imagine tomorrow – the last day of the old rates – it will be even longer. I am not good at waiting so I started taking more pictures. I thought the coffee/tea break cart full of cups was rather interesting. A woman pushed it around with pots of coffee and tea – she seemed to be a better waiter than I am. The circus is back in town. I took this from the second floor balcony. BTW the second floor here would be the third floor in the US. As always the elephants were a big draw. Although they are not as exciting as seeing them in the wild, these two were not chained but were allowed to move freely around in an area enclosed by what appears to be an electric fence. 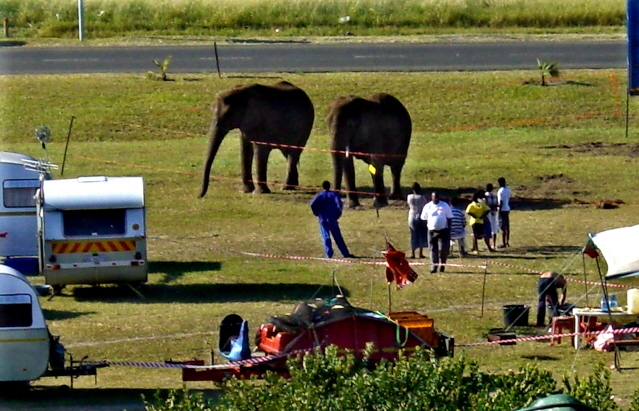 This shot shows the circus and if you look carefully you can see the bay on the Indian ocean. We are going to miss Richards Bay and all the wonderful people that live here. This entry was posted in Mission - South Africa on June 29, 2010 by Bill. When we went to the municipality offices, I noticed that the line for electricity was out the door which means people may be waiting hours to buy their electricity before the rates go up. Mary got stuck in a smaller one on Thursday that only took about 30 minutes. At that time we did not realize why the line was even that long – usually there is only a 5 minute wait. It turns out that electricity is going up 30% on July 1 and people are buying large quantities of pre-paid electricity before it goes into effect. Normally we could buy electricity at any grocery store, but for some stupid reason the municipality shut down all outside sales so everyone has to come in to the city center and buy their electricity. I was there to get some maps for the area book we are making for the Nuzmans. The very nice man who runs the office is not very fast so it took most of an hour to get what should have taken an hour. I would not have minded so much except I had not brought in anything to read and soon exhausted the dated handouts that were available. I did get to take some view shots of the bay and the circus that will be in town for a couple of weeks. We then ran a couple of more errands – including putting some of our favorite spots in the GPS for the Nuzmans – before having lunch. We then drove out to PD to pick up Sandy Chirwa so he could apply for his passport – the last major step for his mission application. One of the things he needed was a certified copy of his identity papers. To get something certified you go to a police station so we went to the one in Esikhawini. We had forgotten that while they will certify things for free, you have to have them copied elsewhere. But just as we were figuring out where to go to get a copy, a very nice man came out and said he would take care of it for us. So he made the copies and then got them certified. I was impressed by his kindness – something that does not often happen here or elsewhere. We then went to the Home Affairs office at Richards Bay and made the application. The young lady who helped us was very helpful and efficient. I noticed that she was wearing a wedding band and I asked about that. It turned out she was engaged and her fiancé had already paid labola – however they have not set a wedding date. I gave her a couple of pass-along cards and told her about the Esikhawini chapel. You never know what might come of giving out a card. At home in the evening we continued to work on getting things organized for the new couple when they come. We are writing down everything we can think of about how to get things done in Richards Bay from buying electricity to where to get replacement cartridges for the printer. Hopefully this will help them acclimatize quickly. I am making book for each branch with the latest branch lists, and other lists that they should find helpful. Now that we have maps we can mark them as to who lives where. Of course this will not work for Port Durnford because even Google does not provide maps for there. During the day I called President Mann just so I could hear his voice say “Hello, President Mann.” He thought that was funny and so I wished him and Sister Mann a safe journey home. Later we got an e-mail telling us about a couple’s re-union with the Manns to be held in August in Provo. I imagine almost all the couples will be there – most of them are from Utah or Idaho – and will be great to meet together. It will almost be like another August Couple’s Conference. However I doubt if we will be able to go on a game drive.